Subscribe to receive notifications of construction updates. As part of the Institute’s investment in infrastructure renewal, work is scheduled to renew the ziggurat of Building 1. 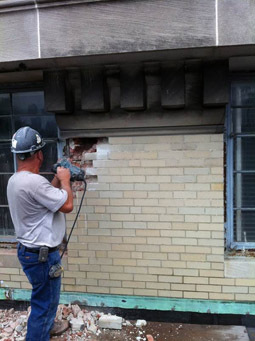 This work includes providing a weatherproof moisture barrier and replacing the limestone and copper. Preparatory activities for this work are scheduled to begin in June with the installation of scaffolding, and demolition activities are targeted to begin in the summer. Construction hours are 7:00 AM – 3:30 PM, with some Saturday work expected. During this project, noise and vibration are expected. Questions may be directed to Eric Ammondson. A renovation project is underway in Building 4. During this time, the south wing of the fourth floor of Building 4 will be inaccessible as it is renovated for future EAPS laboratory space. Demolition activities are scheduled to proceed through January, with crews working Monday-Friday, 6AM–3PM. This renovation work will generate some noise from demolition activities. Any activities generating loud noise are scheduled to conclude by 8AM. While this work is underway, crews are scheduled to transport materials through the fourth floor of Buildings 10 & 3, to the Building 3 loading dock via the Building 3 freight elevator. Material transport is scheduled to occur before 8AM daily. Access to the corridors and stairwells will not be impacted. Questions may be directed to Joe Collins. Beginning Monday, April 1, crews are scheduled to remove the fencing and demobilize the staging area currently occupying Eastman Court. Anticipated hours are 7AM – 3PM. At this time, construction vehicles will be entering and exiting the site through the courtyard via 21 Ames Street. A police detail will be onsite to direct pedestrian and vehicular traffic. The sidewalk in front of the Building 8 staircase and the surrounding area will be restored as part of this work. This construction will generate some noise. While this entrance to Building 8 will remain open, one of the two staircases leading up to the entrance will remain closed during sidewalk restoration. Signage will be posted directing occupants around the area. This work is scheduled through April 30. View the map for more detail. Questions may be directed to Gerhard Sinani. An extension to the existing concrete pad for Building 18 is scheduled to be installed, and the existing equipment reconfigured. Anticipated work hours are from 8:30AM to 5PM. Some noise is anticipated. Portions of adjacent walkway will be inaccessible to pedestrian traffic during work hours. Construction activities are scheduled to commence on Monday, February 4, when New fencing will be added, weather permitting. This activity is expected to last through February 8. The replacement of the tanks in the area will require an additional phase of work. During the final phase, the existing tanks will be removed from service, and temporary tanks will be integrated into the system from a truck loading bed. Two cranes will be used to install the new tanks on the pad. During these operations, there will be some noise from work on the pad, and engine noise from the cranes. More information about this phase will be posted once the schedule has been finalized. The construction vehicles and crane will be entering and exiting the site through the courtyard via 21 Ames Street. A police detail will be onsite to direct pedestrian and vehicle traffic. Questions about Building 18 work may be directed to Meredith Fydenkevez. The Grier Room and adjacent corridor, located on the fourth floor of Building 34, are scheduled for renovation. Demolition of the existing space is underway. Work hours are weekdays from 5AM-4PM, with occasional weekend hours. Noise is anticipated during construction, with high level of noise and vibration concluding by 9AM daily. Occasionally during construction, the fourth floor corridor connecting Building 34 to Buildings 36 and 38 is scheduled to close temporarily. Signage will be posted directing occupants around the area. This project is anticipated to last through January. The fourth floor corridor of Building 34 is scheduled to close temporarily while renovation work is underway on the corridor ceiling. Anticipated work hours are from Friday, March 8 at 5PM through Saturday, March 9 at 8PM. The hallway will remain inaccessible during this time. Signage will be posted to direct pedestrians around the closure. Elevators and stairs adjacent to the closure in Buildings 36 and 38 will remain available to bypass the area. Mild noise and odor is anticipated during this work. Questions may be directed to Julie Azzinaro. Several RLE lab and office spaces located on the fifth, seventh, and eighth floors of Building 36 are scheduled for renovation. On Friday, February 8, demolition of the existing space is scheduled to begin. Work hours are weekdays from 5AM-3PM, with occasional night and weekend hours. Noise is anticipated during construction, with high level of noise and vibration concluding by 9AM daily. Occasionally during construction, corridors in Building 36 will be scheduled to close temporarily; a notification will be sent when the details of these closures are known. Signage will be posted directing occupants around the area. This project is anticipated to last through July. Beginning Friday, March 29, the fifth floor corridor of Building 36 is scheduled to be closed temporarily for construction work. Crews will be onsite from 6PM on Friday, March 29, through 10AM on Monday, April 1. Noise is anticipated. During this time, there will be no access through this corridor. Occupants are encouraged to use the passenger elevators and stairs in Buildings 34 to bypass the area. Elevator access will remain available for other floors and the lobby of Building 36. Signage will be posted directing occupants around the area. From Saturday, March 30, through Tuesday, April 2, the eighth floor men’s restroom of Building 36 is scheduled to close temporarily for construction work. Heavy noise is planned to conclude by 9AM on weekdays, with some occasional light noise for the duration of the work day. Occupants will be directed to alternate restrooms in Building 32. In order to create a more comfortable and contemporary learning environment, the lecture hall in Room 37-212 has been redesigned. This renovation will renew the tiers and create a new layout of fixed classroom furniture. Along with upgrades to the entrance corridors and the adjacent restrooms, the new space will integrate a modern lighting and audio visual system. This project is scheduled through January. The restrooms on the second floor are scheduled to close for the duration of the Room 37-212 project. Beginning Monday, October 1, second floor women’s and men’s restrooms are scheduled to close for construction. Occupants are encouraged to use the restrooms located on the third floor of Building 37, or those on the second floor of Building 35. Signage will be posted directing occupants to the closest facilities. Construction is underway. Work hours are daily from 6AM-3PM. Noise is anticipated during construction, with high level of noise and vibration concluding by 8:30AM daily. During construction, the second floor corridor connecting Building 37 to Building 35 is scheduled to be closed temporarily; a notification will be sent when the details of this closure are known. Signage will be posted directing occupants around the area. Questions may be directed to Meredith Fydenkevez. Construction is underway on an upgrade to MIT’s Central Utilities Plant, which includes the construction of a building on the former N10 Annex Parking lot. Hours for this work are 7AM – 5PM Monday-Friday with some weekend and evening work expected. The project is scheduled to conclude in 2020. Phase 1 activities for the project are expected to include site preparation and enabling, site excavation,utility work, and the construction of foundations. Pressure injected footings (PIFs) will be used to support the building. During this phase, two-way traffic will be maintained on Albany Street, moderate noise and vibration is expected during PIF installation, and construction vehicles will travel through the area. During this phase, the new addition’s steel structure will be constructed and its exterior wrapped, leaving the roof open. Slabs and floors will be built. A crane will be located on Albany Street during the installation of the large equipment for the plant. During this phase, Albany Street will become one-way from the intersection with Portland Street to the Albany Garage entrance. Two-way traffic will be maintained from Main Street to the entrance of the Albany Garage. For a short period during the summer of 2018, the section of Albany Street from Portland Street to the garage entrance will close. Garage access will be maintained during that period as well. Most activities take place inside the building during this phase, with interior fit out and finalizing and testing system installations. Exterior streetscape and landscape work will include new lighting for public walkways as well as new public seating, trees, and other plantings. In the spring of 2019, Albany Street is scheduled to reopen to vehicles and pedestrians between Portland and Main Streets. The walkway between the construction site and Albany Garage will close for a period during spring and summer 2019 for streetscape and landscape work. The large crane has been demobilized, and exterior façade installation has begun on the south side of the new Central Utilities Plant. One lane of Albany Street and the adjacent sidewalk has been reopened. Albany Street has been narrowed to one lane from Portland Street to the Albany Street Garage (N4). During this time, traffic through this area will be one-way from Albany Street to the intersection of Albany and Portland Streets. Traffic will remain two-way from the Albany Street Garage (N4) entrance to Main Street. Construction hours are 7AM – 6PM Monday – Friday and 7AM - 3:30PM on Saturdays, with some additional weekend and evening work expected. On Wednesday, May 2, the alley/fire lane between Building 42 and the railroad tracks is scheduled to be closed to through traffic for the remainder of the CUP construction project. During this time, the lane will be impassable to vehicles and pedestrians. Pedestrians are encouraged to use the Vassar Street sidewalk. The pedestrian path across the railroad tracks connecting Albany and Vassar Streets will remain open during construction. Beginning Monday, April 29, traffic patterns are scheduled to shift near the MIT Central Utilities Plant project, weather permitting. Albany Street is scheduled to be inaccessible to vehicular traffic from the intersection of Portland and Albany Streets to the entrance of the Albany Street Garage while equipment is installed onsite. This closure is scheduled from Monday, April 29, through Friday, May 10. This proposed closure will occur from the intersection of Albany and Portland Streets to the entrance of the MIT Albany Street Garage (Building N4). Traffic will remain two-way from Main Street to the entrance of the Albany Street Garage (Building N4). The sidewalk may be intermittently closed during construction. A police detail will help direct pedestrians and cyclists around the area as needed. The pedestrian path, located between the Albany Street Garage and the CUP construction site, will remain open and accessible. The section of path from the rear of the Albany Garage to Vassar Street (across the railroad tracks) will remain open. Visit the Powering MIT site to learn more about the project and to view updates. For regular updates, subscribe to the weekly construction forecast emails. Questions about this work may be directed to Frances Boyle. The driveway located in front of Building 44 next to the pedestrian railroad crossing is scheduled to undergo emergency utilities repairs beginning March 21. Anticipated work hours are 7AM- 3PM; work will continue until the issue is resolved. Noise from excavation activities and machinery is anticipated. Questions may be directed to Cori McKee. Crews are scheduled to be onsite to assess the envelope of Building 54. A schedule will be provided for additional activities as the project progresses. This exploratory work is scheduled to continue through mid-May. See an overview of the project here. Questions may be directed to Sarah MacDonald. Work is underway to renew and modernize two of the passenger elevators located at the lobby between Buildings E18 and E19. The work will include installing new equipment and new cab finishes. Anticipated work hours are 6AM to 2PM, Monday-Friday, with some noisy work scheduled during the earlier morning hours. The elevators will be modernized one at a time, allowing two to remain operational while one is out of service. One car is scheduled to be out of service through mid-April. Then the second car will be removed from service through June, 2019. Signage will be posted. Modernizing the elevators will replace obsolete equipment, protecting the safety of the MIT community while improving the day-to-day experience of building occupants and visitors. The scope of work includes renewing the elevators by installing new equipment (machines, controllers, cables, and motors) and new cab finishes. Most of the work will take place in the elevator machine room and elevator shaft. Some minor noise is expected. A crane is scheduled to be located along Ames Street on Saturday, April 6 from 8AM to 11AM. The crane will be located in several metered parking spaces of the northbound lane of Ames Street. The sidewalk will be closed in front of Building E18, and pedestrians will be routed to the other side of the street next to Building 68. All doors to Buildings E17, E18, and E19 will remain accessible throughout this work. Signage will be posted. Questions may be directed to Kevin Connolly. Work is underway to renew and modernize the passenger elevators in Building E23. The work will include installing new equipment and new cab finishes. Anticipated work hours are be 6AM to 2PM, Monday-Friday, with some noisy work scheduled for earlier morning hours. The elevators will be modernized one at a time, allowing one to remain operational while the other is out of service. Car #1 is scheduled to be out of service through December. Once completed, Car #2 will be removed from service through April, 2019. Signage will be posted; occupants are encouraged to use the elevators in the lobby of Building E25. Questions may be directed to Mike Morizio. For the most up-to-date information about the Kendall Square Initiative, visit the courbanize project profile. Click the “Follow” button to sign up for an account and receive notifications about the project. MIT is proposing to bring new vibrancy and diversity to Kendall Square - "the most innovative square mile on the planet." MIT is now poised to deliver a dynamic blend of uses in this area, including housing, lab and research space, retail, innovation space, open space, and a dedicated facility for the MIT Museum. Learn more about the Kendall Square Initiative. Construction in Kendall Square kicked off in September 2016. Ultimately, this visionary project will deliver a dynamic blend of uses in the area, including graduate student, market rate, and affordable housing; lab and research space; innovation space; retail and open space; and a new facility for the MIT Museum. Following the approval by the City of Cambridge Planning Board in May, utilities and infrastructure work is now underway to prepare the area south of Main Street, between Carleton Street and Wadsworth Street, where new buildings will be sited. Construction hours are scheduled for 7AM – 6PM weekdays, and Saturday from 9AM – 6PM. Questions about the construction phase of this work may be directed to Alison Crowley (MITIMCo). Visit the courbanize project profile to review details about the planned activities and to subscribe to construction updates. Subscribe to notifications by clicking the “Login” button at the foot of the “Comment here” box to sign up for an account, and then “follow” the project. Phase 1 (fall 2016- fall 2017): Upgrade of existing and addition of new utilities along Amherst, Carleton, Hayward, and Wadsworth Streets; closure of Hayward Parking lot. Parking for MIT Medical will remain available. During construction in the Hayward Lot, patient parking for MIT Medical will remain available. Reserved MIT Medical patient spaces currently in the Hayward lot will soon be relocated to a new lot being constructed next to Building E33. Cars that are in the lot for more than two hours are subject to towing. If patients have appointments that exceed two hours, MIT Medical will contact the Parking Office on their behalf. The location of the patient parking area may change as construction proceeds. We will inform the community before any changes occur. The pedestrian plaza connecting Carleton Street to the inbound Kendall Square MBTA Station on Main Street is closed fully for the duration of the project to allow construction of an underground garage in this area. Pedestrians will be guided to seek alternate paths to and from the station using Ames Street, Dock Street, or Wadsworth Street. Access to the MBTA station and elevator will remain open and accessible on the Main Street side of the station throughout this work. Carleton Street will remain open to vehicular traffic from Amherst Street to the Medical Parking Lot. See a map of the area. Access to Wadsworth Street from Main Street is closed to all traffic. The Sloan and Eastgate lot entrance is closed at Wadsworth Street through this phase. Construction vehicles and equipment will continue to be set up and operate in this area and at the intersection with Wadsworth Street. The noisiest work will come from the intermittent use of vacuum trucks. The walkway onto Wadsworth Street from Main Street has shifted to the West side of Wadsworth Street, and then crosses diagonally to the East side as the construction work zone is progressing North towards Main Street. Eversource crews are installing a new gas line in the path of the covered pedestrian walkway for the next month. A temporary walkway is in place. Bike traffic will use the full lane during this time. Installation of a new Eversource gas pipe will take place between E51 at the Wadsworth Street intersection and 100 Memorial. Amherst Street will have a one-way traffic pattern going towards Ames Street. At Amherst corner between the Media Lab (E14) and Medical (E23), the pedestrian walkway will be closed and the bike rack closer to E14 will be unusable for approximately a week beginning the week of March 4th to install conduit. Pedestrian access to both buildings will be maintained on the sidewalks along the streets. The bike rack closest to Carleton Street will continue to be available. The building’s concrete core and the garage’s auto ramp construction work is ongoing. Reinforcement steel, concrete operations and excavation will continue on site 3. Access to the MBTA station and elevator will remain open and accessible on the Main Street side of the station throughout this work. Excavation work continues on the Kendall Garage behind 292 Main (E38), 290 Main (E39), and 238 Main (E48). Site 4's concrete for the 15th floor south and 16th floor north is in progress and is supported from Carleton Street and Hayward Street. Mega panel installation will begin on Monday, January 7th, and the work will take place on 2nd shift from 6:00 PM to midnight. E39 slab on deck installation has started and is being serviced from Carleton Street. Finishing of the concrete slab will require extended site hours on days of placements. Mega panel installation continues on 2nd shift, from 6:00 PM to midnight. Site 5’s concrete core construction is complete to the 19th floor, and is being staged on Carleton Street and Charlottes Way. Daily deliveries of steel and concrete and removal of materials will take place from Amherst Street to Carleton Street or in and out through two Main Street gates. Steel installation continues up to the 4th floor. Hayward Street will be closed from Main Street to Amherst Street to all vehicular and pedestrian traffic until further notice. Hayward Street will only be accessed by Turner Construction vehicles for the duration of the Kendall utilities and garage construction. Large equipment will be removed and brought to site on and on-going basis. This activity may occur after hours but no disruptions are expected. General construction activities will continue on Saturdays. Work will occur within the City of Cambridge allowable work hours, 9:00 am to 6:00 pm. From April 29 through May 10, seven cherry trees are scheduled to be planted in front of W20 along Mass Ave. Anticipated work hours are weekdays between 7AM-3:30PM. This work will be fenced off to protect pedestrians in the area. Some machinery noise is anticipated. The surrounding landscape will be restored upon completion. Questions may be directed to Megan Kefalis. Renovations to the restrooms in the basement of Building W20 are scheduled to begin Monday, March 18. The project will provide upgrades to the interior finishes and new lighting. To accommodate this work, the women’s, men’s and unisex restrooms located in the basement of Building W20 are anticipated to be closed for one month. Construction activities are planned for Monday through Friday from 6AM – 4PM. During this work, the current restrooms on floors 2, 3, and 4 will remain available. Signage will be posted on the restrooms and additional signs will be posted in the building. Questions may be directed to Jason Caputo. Subscribe to weekly construction activity forecasts for the Vassar Street Residence Hall. Construction activities are ongoing as MIT proceeds with a new undergraduate residence hall on the site of the West Garage parking facility (W45). As part of its mission to enhance the student experience, the project will add 450 new beds and has a target completion date of Fall 2020. Construction hours are 7AM – 6PM, Monday-Friday with some weekend and evening work expected. Two-way traffic will be maintained on Vassar Street. Construction vehicles will travel through the area. Crosswalks will be installed at each corner of the site and pedestrians will be directed to the sidewalk on the south side of Vassar Street for the length of the site. A shared bike lane will be created in the westbound lane of Vassar Street to be shared by bicycles and vehicles during construction. The eastbound bicycle and vehicle lanes will remain unchanged. Enabling activities (October – December 2017): During this phase crews will prepare the site for construction. Activities include utility work, relocation of the Grounds Department to Albany Street, and final closure of the West Garage (which has been used on occasion for events during site prep.) In December fencing will be installed to establish the construction perimeter. Demolition (January 2018–April 2018): During this phase the West Garage will be demolished. Cranes, excavators, and sawcutters will be used to disassemble the structure and materials will be hauled offsite. Foundation work (April 2018–October 2018): The foundation of the new residence hall will consist of precast concrete driven piles. Noise and some vibration are anticipated during this work. Occasionally crews will be removing large equipment overnight from the Vassar Street Residence Hall construction site, weather permitting. This work is scheduled to occur from 4AM-6AM. Trucks are scheduled to enter and exit the site from Vassar Street using the western gate near Building W59. Noise from the trucks and loading activities is expected. Street utility work is scheduled on Vassar Street adjacent to the new residence hall construction site. At times, traffic patterns are scheduled to shift. The travel lanes will be temporarily impeded, and east/west traffic will be intermittently stopped as the street is narrowed to one lane. A police detail will help direct vehicular traffic, cyclists and pedestrians in the area. Anticipated regular project work hours are 7AM-6PM, Monday-Friday. Some noise is expected throughout this process. This work is scheduled to continue through August. On Friday, April 5, extended night work is scheduled at the Vassar Street Residence Hall site, weather permitting. Anticipated work hours for the day are 7AM-midnight. A reduced crew will be onsite after 6PM to finish concrete on the east end of the roof slab. Some minor noise is expected during this operation. Concrete trucks will be onsite through the early evening. On Wednesday, April 10, extended night work is scheduled at the Vassar Street Residence Hall site, weather permitting. Anticipated work hours for the day are 7AM-midnight. A reduced crew will be onsite after 6PM to finish concrete on the west end of the fourth floor slab. Some minor noise is expected during this operation. Concrete trucks will be onsite through the early evening. On Thursday, April 11, extended night work is scheduled at the Vassar Street Residence Hall site, weather permitting. Anticipated work hours for the day are 7AM-midnight. A reduced crew will be onsite after 6PM to finish concrete on the west end of the roof slab. Some minor noise is expected during this operation. Concrete trucks will be onsite through the early evening. To learn more about the project, visit the Capital Projects site where you can link to news articles and view renderings of the site design. Questions about this work may be directed to TJ Fanning. Work to replace exterior electric manhole covers is scheduled from April 22 through April 26. Work will be performed along Ames Street adjacent to Building 68, around Buildings E52 and E53, and along the railroad tracks behind the Central Utilities Plant, Building 42. Anticipated hours are from 7AM through 3:30PM daily. Please be aware and use caution when traversing these areas. Some noise and vibration is expected. This work is part of a multi-month project to replace exterior electric manhole covers at various locations across campus. Updates will be provided as the locations shift. Questions may be directed to Greg Walson. Crews are excavating and replacing an existing fire protection main located in the Main Parking Lot between Buildings 3 & 5. Work hours are Satudays from 7AM to 3PM. Some noise and vibration is anticipated. Delivery access to the Pappalardo Laboratory and other spaces will be maintained throughout construction. On Saturday and Sunday, April 27-28, crews are scheduled to pave the Main Parking Lot between Buildings 3 & 5. Work hours are from 6AM to 4PM. Heavy machinery noise, vibration, and odor are expected. The parking lot will remain unavailable and pedestrian access will be restricted during this work. Throughout the week of April 22-26, emergency utilities work is scheduled to continue at Brigg’s Field between Buildings W36 and W55. Anticipated work hours are from 7AM-3PM daily. This project will involve heavy machinery and excavation, and some noise and vibration are expected. The Vassar Street sidewalk may be intermittently closed while a vacuum truck is parked next to the fence. A police detail will help direct pedestrians, traffic, and cyclists around the area. The bike lane will remain accessible and traffic will be maintained during construction hours. Please use caution when traveling in the area. Questions may be directed to Vaughn Crayton. In an effort to improve storm water management in the area due to current and future development, MIT is planning to install a new drainage structure from Talbot Street to the Charles River. Once installed, the structure will be owned and maintained by the City of Cambridge. While some work activities are underway this month, the substantive work is scheduled to begin in August of this year and continue through the Fall of 2019. Work hours are 7AM – 6PM Monday to Friday, with some occasional Saturday work scheduled between 9AM – 6PM. Crews are scheduled to work on short sections of underground pipe along Amherst Alley. Noise and dust are expected. The noisiest work will come from vacuum trucks and concrete chipping as trenching begins. This work is scheduled to start at the intersection of Amherst and Vassar Streets in October and move along Amherst Alley towards Next House, a section at a time. Crews are mobilizing in the Westgate Parking Lot to relocate the entrance to the corner of Vassar Street and Amherst Alley. Several parking spots will be inaccessible during this transition. Pedestrian access will be maintained around the perimeter of the lot. Once the new entrance is established, the existing gate will be removed from service until the end of the project. The entrance to West Lot has been temporarily altered, and the parking lot divided in two. During this time, one lane of the existing entrance will be maintained for entrance and egress near the MIT Police Headquarters, Building W89. A temporary eastern entrance has been added in the loading dock circle of Simmons Hall, Building W79. Several parking spots will be inaccessible while construction vehicles work to install the connecting pipe from north of the lot through to Vassar Street. Pedestrian access will be maintained from the railroad crossing to Vassar Street. See the map for an illustration of the entrances and traffic patterns in the lot. Excavation activities in West Lot are scheduled to begin on Friday, January 11, with asphalt stripping. Some noise from an excavator, backhoe, and dump truck is anticipated. Trench boxes are scheduled to be installed which will open up the entire length of the West Lot trench at once. This activity is expected to extend for two weeks. Installation of the culvert is scheduled to begin on Monday, January 28. Excavation activities along Amherst Alley are scheduled to begin Tuesday, January 29. During this time, the road will be closed to through traffic. The entrance to the Westgate parking lot will remain open and accessible at its current location, but vehicular access to the lot will only be available from Vassar Street to Amherst Alley. Loading docks for housing will remain accessible. Noise from the excavation and construction machinery is anticipated. Pedestrians in the area will be rerouted around the work site, which extends from the entrance to the Westgate Lot to Memorial Drive; all are urged to use caution when traveling through the area. During this time, the shuttle stop for Westgate/Tang currently located on Amherst Alley will be relocated to Audrey Street in front of Building W84. The SafeRide shuttle pick-up location in front of Next House will be redirected to the corner of Amherst Alley and Fowler Street. Signage to direct pedestrians and traffic will be posted. Sheet pile driving on the river side of Memorial Drive is underway, and is scheduled to continue through the end of February. Saturday work is scheduled for February 2 and 9, from 9AM-4PM. This work will be very noisy, and will involve a vibratory hammer to drive the sheets in place. The noise will be intermittent throughout the day, but very loud when sheets are being driven. The entrance to the Westgate parking lot has been temporarily relocated to the corner of Amherst Alley near Vassar Street. During construction, vehicular access to the lot will only be available from Vassar Street to Amherst Alley. This gate location will be in place for the remainder of this project. Contact Alison Crowley for questions. Crews are scheduled to restore the covered pedestrian walkway on Main Street as Eversource crews finish the installation of a new gas line in the area. Pedestrians will be directed across to the north side of Main Street (the Google side) between the MBTA headhouse and Dock Street at the Kendall Hotel. This work will start March 15 and through the next week. Signage and police will direct pedestrians in the area. Bike traffic will continues to use the full lane during this time. Eversource Electric is scheduled to dig test pits and install manholes on Purrington Street starting the week of February 18. The work will progress to each new manhole location on Purrington Street from Cross to Pacific Streets in preparation to install underground electric conduit to expand their network. (View attached map.) Eversource crews plan to work from 8 AM to 5 PM Monday through Friday over the next two months, weather permitting. A few manholes need to be installed along the route including one adjacent to Edgerton House near the intersection of Cross and Purrington Streets. After the manhole work is complete, Eversource plans to install new conduit between the manholes. Vacuum trucks along with other trucks and equipment will be in operation and will occasionally create noise. Vehicular and pedestrian traffic will be maintained, and police details will be on site to assist. Eversource Electric is scheduled to install manholes on Waverly Path (between Buildings NW35 and NW86) starting the week of April 8. This work includes the installation of underground electric conduit to expand the Eversource network. Eversource crews plan to work from 7 AM to 4 PM Monday through Friday over the next two months, weather permitting. Waverly Path will be inaccessible during work hours from April 8 through April 26. Pedestrians and cyclists will be directed around the area via Pacific and Albany Streets. After the manhole work is complete, Eversource plans to commence trench work. During this phase, pedestrians and cyclists will be allowed access to the path, though one half of the path will be obstructed, and occasional full closures may briefly occur. This work is scheduled from April 29 through May 27. Vacuum trucks along with other trucks and equipment, such as backhoes and jackhammers, will be in operation and will occasionally create noise. Police details will be onsite to assist. Contact Matt Viens for questions. To improve safety and reliability for users of the street, the City of Cambridge is implementing “quick build” changes to Massachusetts Avenue from Sidney Street to Memorial Drive with an emphasis on increasing the comfort and convenience of people walking, biking and riding buses. This project supports the City’s Vision Zero goal to reduce and eliminate serious injuries/fatalities from crashes, as well as City policies that promote the use of sustainable ways to travel in Cambridge. Fall construction is complete. Spring dates will be posted as soon as they are known. October 29-31: Overnight work is scheduled Monday through Wednesday. During this time, the pavement will be ground. High levels of noise are anticipated. October 31-November 2: Daytime work is scheduled Wednesday through Friday, including installation of lane markers and signal work. Week of November 5: Installation of flex posts and green cyclist pavement markings. Spring 2019: Additional pavement markers will be completed. Visit the City of Cambridge project site for more information. Contact Patrick Baxter for questions. Effective immediately, and continuing through Sunday, March 31, 2019, the Department of Conservation and Recreation (DCR) will implement a right lane closure along Memorial Drive (eastbound) between Amesbury Street and Fowler Street in the City of Cambridge to accommodate a municipal outfall project. Traffic and pedestrian patterns will be clearly marked, and a police detail will be on site. The Massachusetts Department of Conservation and Recreation (DCR), an agency of the Executive Office of Energy and Environmental Affairs, oversees 450,000 acres of parks and forests, beaches, bike trails, watersheds, dams, and parkways. Led by Commissioner Leo Roy, the agency’s mission is to protect, promote, and enhance our common wealth of natural, cultural, and recreational resources. To learn more about DCR, our facilities, and our programs, please visit www.mass.gov/dcr. Contact us at mass.parks@state.ma.us. Contact Olivia Dorrance for questions. For updates on the construction at One Broadway, visit this page. Contact CSL Consulting for questions.